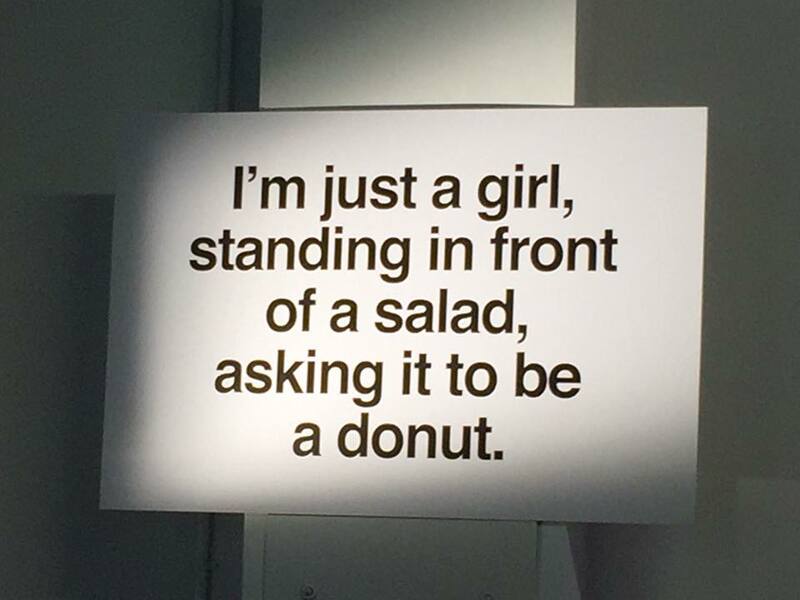 Note: I use the spellings doughnut and donut interchangeably here. It is deliberate. Usually based on the name of vendor. 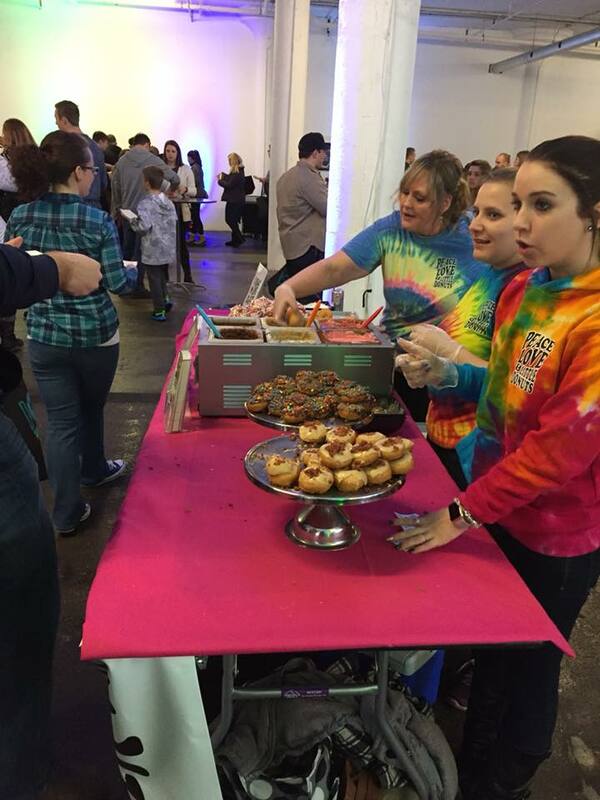 Today was Cleveland’s second annual Donutfest. I didn’t hear about it until it took place last year, and it had sold out way ahead of then – in fact it sold out in 3 hours. So this year my friends and I marked the sale date on the calendar. Tickets were $35 for General Admission and $50 for VIP. VIP times ran 9 – 11 a.m. (let’s face it – I am not a morning person, so there was no way in hell I would be attending the VIP session). There were two hour GA sessions beginning at 11. 11 was a stretch for me, but I made it. 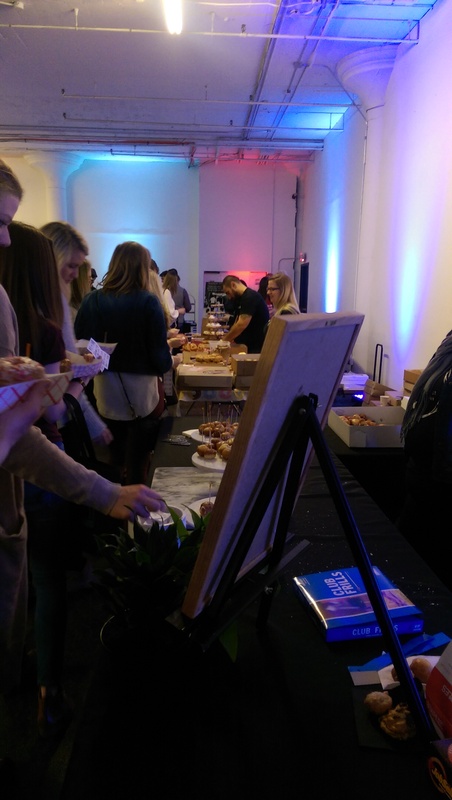 GA tickets included 11 doughnut tastings, three coffee tickets, and a goodie bag. VIP tickets included early entry and a mug as well. This was way better than Cheese Fest, but considering the bar on that is so dreadfully low that isn’t saying much. The lines were manageable, and breaking it up into two GA sessions definitely helped. There were only two long lines – for Brewnuts and for the four tables on the right-hand wall. I think the idea of tickets definitely slowed things down. A punch card might be easier to deal with. I didn’t follow the numerical order, so I had a few loose tickets in my hand at one point. I gave the wrong ticket to one competitor, and they handed it back so I could correct it. I understand the need to control that people don’t act like vultures, but it took folks a while to tear their tickets while at the table. Just a suggestion if one of the organizers ever reads this. I had to park on Rockwell, because parking closer to the event was non-existent. If I had known I could park in one of the empty lots I would have. Trudging through unshoveled snow on the sidewalks on Rockwell and E. 24th was no picnic, but they had shoveled and put salt down in front of Red Space so yay. Winters in Cleveland, man. While crossing the street I saw Crystal from Eat*Drink*Cleveland as she was leaving. She gave me the pro tip of buying a box for $1, which I happily took. The money went to the Cleveland Food Bank. They also had hats and t-shirts to buy with proceeds going to the Food Bank. I was also impressed that a couple of people dressed for the occasion. 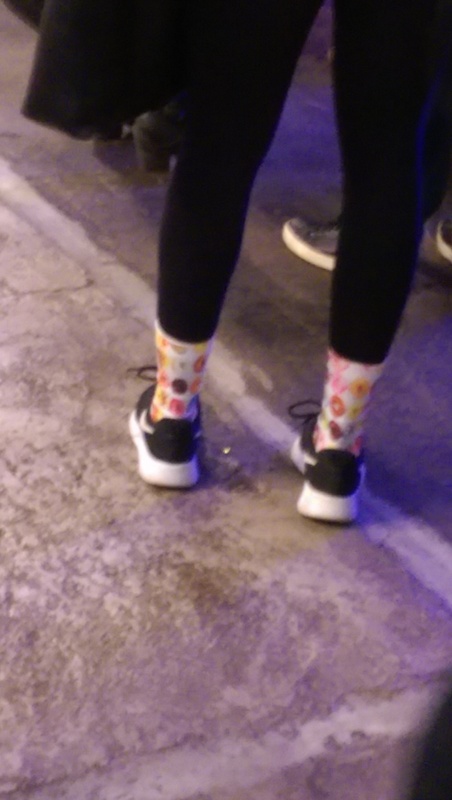 One girl wore these stylish doughnut socks, while a dudebro had a doughnut baseball cap on backwards. One woman wore an OSU onesie, and I applaud her bravery because it got pretty darn hot in the space. Once I got inside I was confronted by a huge line. It turns out this was for four tables at once (including crowd favorite Jack Frost), so I headed for the less congested tables first. I eventually collected my 11 doughnuts, and my friends and I grabbed a table. I took one bite out of each of the doughnuts and chose my favorite. It was sometimes hard to remember which doughnut belonged to which vendor. 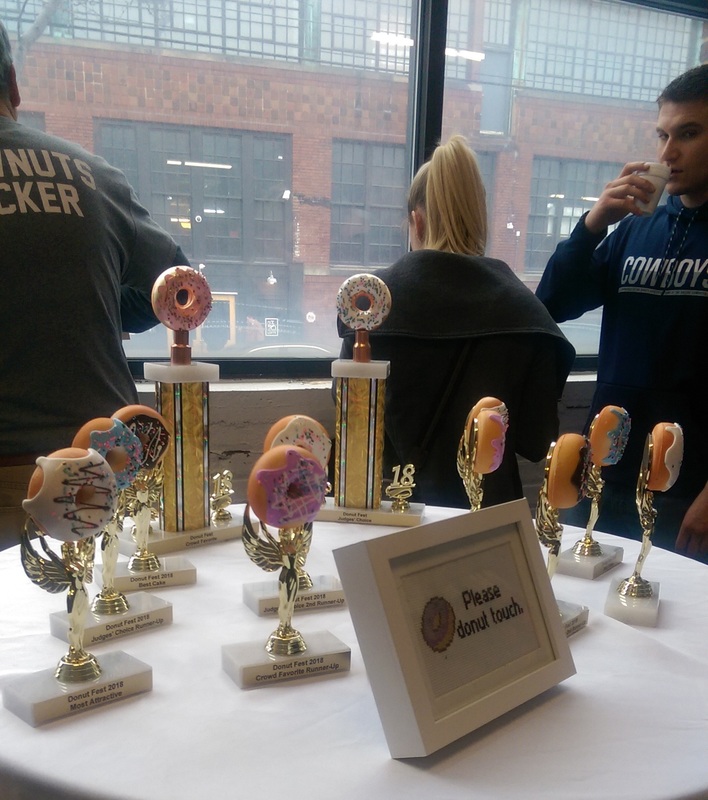 The competitors this year were Holey Toledough; Brewnuts; Madsen Donuts; Peace, Love & Little Donuts; Jack Frost; The Vegan Doughnut Company; Urban Farmer; Fiona’s Coffee Bar & Bakery; City Girl Donuts; Mary Ann Donuts; and Jubilee Donuts. Bigmouth Donuts was at the Kurentovanje Party on E. 55th, which makes sense since that is where they were located. I’ll have to try their dossants another time. I had also hoped Biagio’s would be there, because I have heard good things about their doughnuts. Or Spudnuts? Maybe next year? This was a great opportunity for doughnut shops to get their names out there, because I was unfamiliar with most of them. Unfortunately, some of them are not exactly local, which explains why they were unknowns. Holy Toledough offered a carrot cake fritter or a peanut butter & jelly doughnut. I went with the PB&J, which was a fun little doughnut. But they are in Toledo, so I don’t see myself ever having them again. There were a couple of competitors from Norton and Canton, which are closer than Toledo. I think Mary Ann Donuts (with five locations to the south of us) might have been the one offering a cherry cream stick or a chocolate cream stick. I chose the cherry, because it was different. It’s all about preference, and everyone has different taste. I prefer a yeast doughnut over a cake doughnut. Others prefer cake over yeast. It’s all subjective. Most of the competitors offered several choices to allow people to choose their favorite. 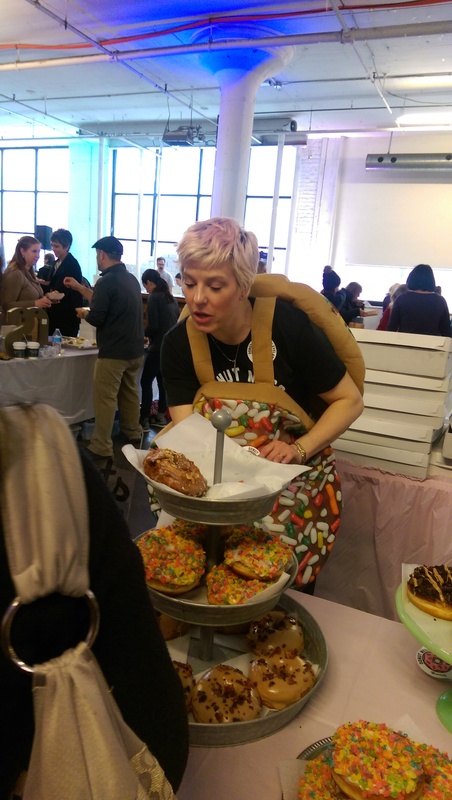 For example, one competitor offered a key lime doughnut, a birthday cake doughnut, and an espresso crunch doughnut (I went with the espresso crunch). Some had boxes of doughnuts that they would cut and restock. Others were putting the finishing touches to keep up with the demand. For example, Peace, Love & Little Donuts were dipping their doughnuts fresh. I very much enjoyed their M&M donut. It was soft and fresh, and the M&Ms were a nice crunchy topping. Circles on the Square in Medina won Judge’s Choice for their Caramel Apple Pie doughnut. It was a cake doughnut so it wasn’t my favorite, but it had a nice flavor and caramel apple is always a good choice. Jack Frost is obviously a fan favorite because they were the only table handing out almost-full-sized doughnuts instead of quarters, halves or small tastes. They won Crowd Choice last year along with Peace, Love & Little Donuts. They had lots of their popular flavors, including maple bacon, chocolate custard, and plain glazed. 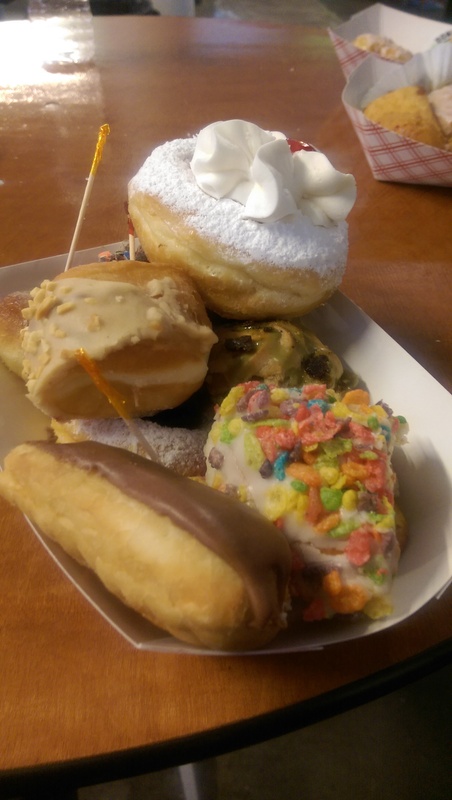 Because I have already had most of those choices I chose the strawberry shortcake doughnut, which I very much enjoyed, but I did not enjoy the shower of powdered sugar down the front of my brown t-shirt. 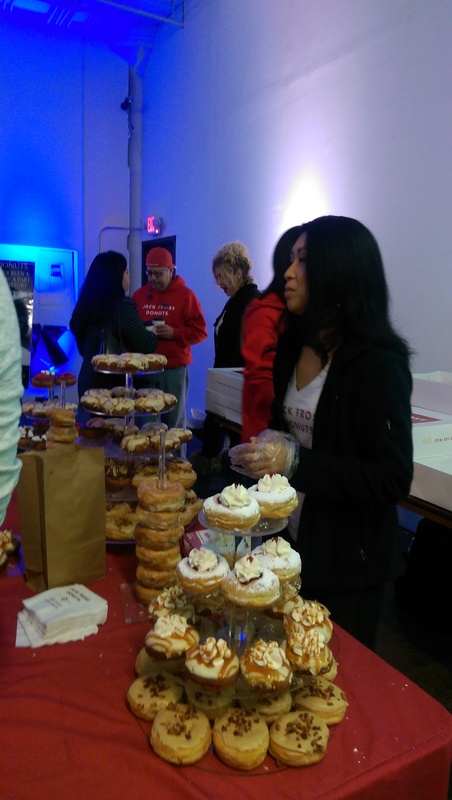 This year’s Crowd Choice, Brewnuts, had the long line to prove it. They had three or four choices to choose from. I chose the Fruity Pebbles Brewnut, because come on, fruity pebbles! 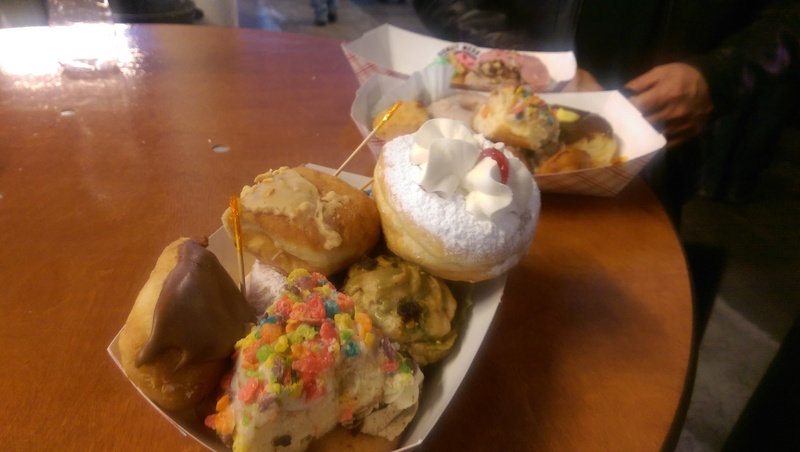 The doughnut had a nice crunch from the Fruity Pebbles and the doughnut itself. It also had a hint of ale to it. Because Brewnuts. They are craft beer-based doughnuts, and everyone loves them. I will definitely be seeking them out in the future. I also enjoyed Madsen Donuts’ (from Geneva on the Lake) marshmallow filled eclair-type doughnut, and was pleased with the Vegan Doughnut Company’s choice. They served a creamy doughnut hole. I didn’t even miss the dairy. Overall, I enjoyed all of the doughnuts but one. Urban Farmer, I love you, but putting up a foie gras doughnut against all those conventional (mostly sweet) doughnuts was super jarring. I was in the long line for the last four doughnuts, and the guy behind me warned of the “strange flavor of the filling” in that doughnut. It didn’t help that I had thought I had chosen the butterscotch doughnut, but alas I had not. I’m sure it would work well as an appetizer in the restaurant, but up against all the other sweeter choices (and less adventurous attendees) it just didn’t work. Out of all 11 doughnuts I tried, my favorite doughnut was a lemon goat cheese doughnut with blueberry topping from City Girl Donuts. It was also an almost-full-sized doughnut. The doughnut really packed a flavorful punch that wowed my taste buds. I have heard good things about City Girl Donuts, which opened in September 2017 and has been a huge hit in Rocky River. I’ll definitely be seeking them out again. 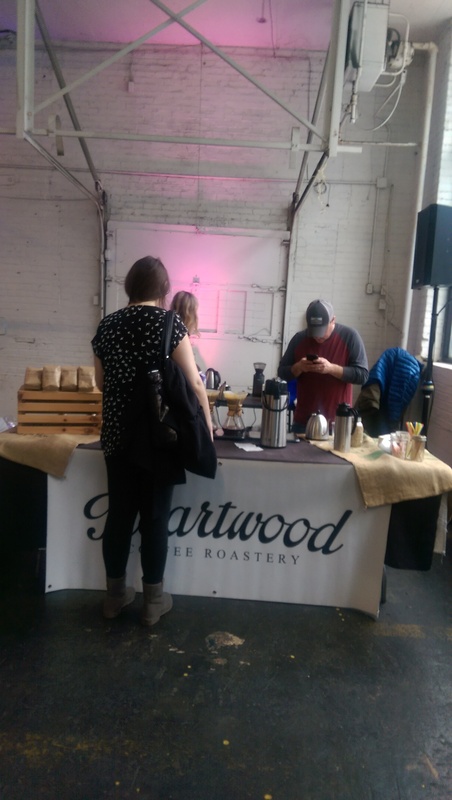 At some point I also grabbed some coffee (one pour-over from Heartwood coffee and one cold brewed iced coffee from Solstice Coffee Roasters) and happily sampled the Hartzler milk samples while in the long line for four different doughnut vendors. 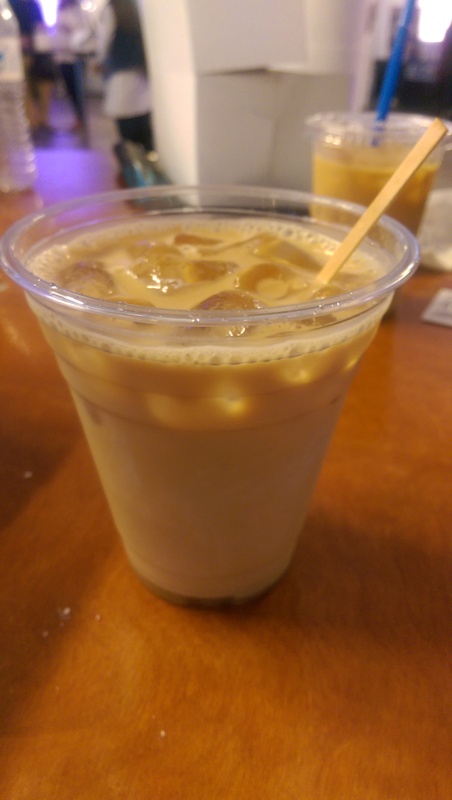 Love their chocolate milk – especially with coffee! I’ve been all about the paczki in the last couple of weeks, so I think it is fair to say that I am officially doughnuted out for a while. 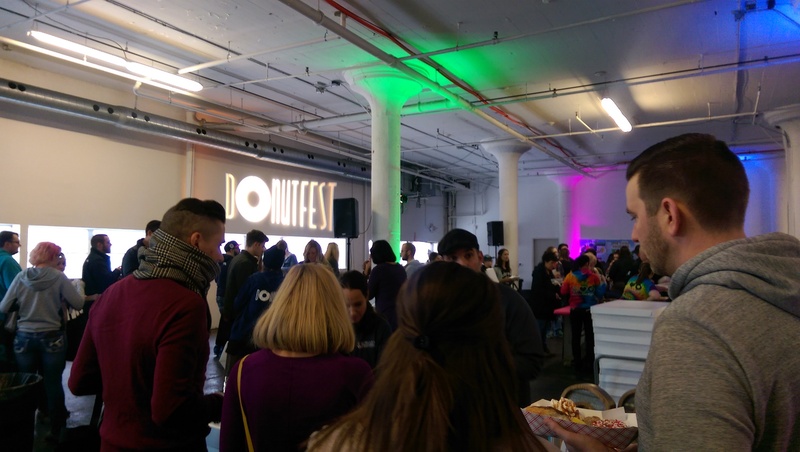 I may or may not attend next year’s Donutfest. The space was really cool, and it was good venue for this event. It was a lot of fun and wasn’t nearly as crowded as Cheese Fest. The doughnuts were all fantastic. But $35 is a lot of money for 11 small doughnuts and a couple coffee samples. If you haven’t done it I can recommend it. Would I do it again? I’m not sure, but I didn’t hate it or regret getting up so early after a late night out at a cooking class at Kitchen 216 and nightcap at Coquette Patisserie. Disclosure: I bought my own ticket and was not compensated in any way, shape or form for attending.